A Sweet Treat Ski to Avalanche Lake Celebrated with Fireworks! 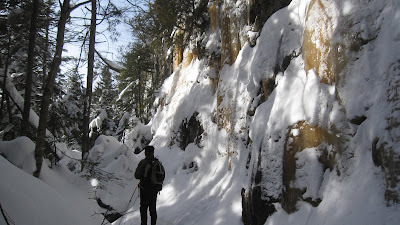 Caramel Cliffs on the way to Avalanche Lake in the Adirondacks. Yesterday will go down in my Adirondack outdoor record book as one of the most memorable. A delightful ski trip to Avalanche Lake in perfect conditions was celebrated by my first Adirondack thunder and lightning snow storm last night. I’ve been told this type of weather phenomena has occurred here in the Adirondacks in the last 25 years, but I missed it. I am glad I caught it last night; it was extremely interesting and wild. 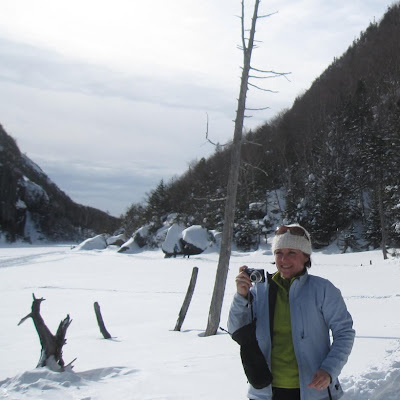 The temperature was quite moderate compared to recent trends: twenty-seven degrees at night is rather warm for the Adirondacks in early February. The storm itself blew in quickly and dropped about 6 inches of heavy wet snow and then switched to sleet and then some kind of snow pellets, which is when the lightning and thunder started. The lightning lit up the sky which reflected off the snow covered ground for an iridescent effect. A thunderclap followed each flash whose reverberations seemed to shake the house. By early morning, heavy snow had tapered to flurries. 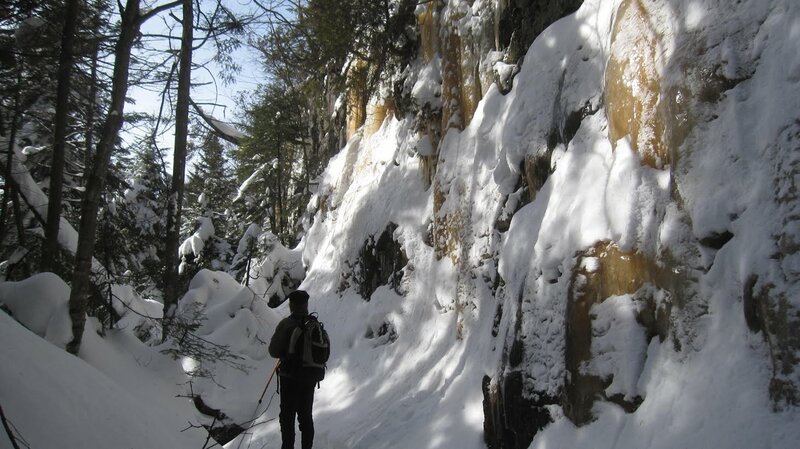 It was a cool weather experience with excellent implications for backcountry ski conditions. Some unnamed crack on Mt. 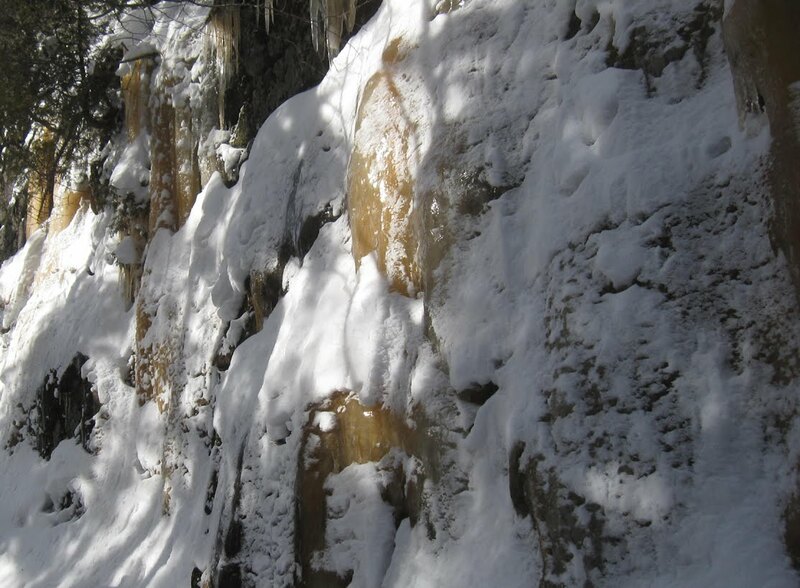 Colden remains bare rock. This brings me to the backcountry trip report. 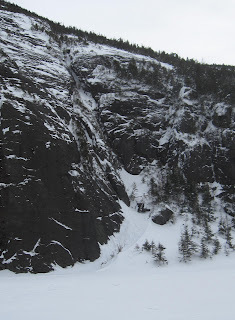 Yesterday’s excursion to Avalanche Lake revealed very good conditions with fresh snow and good coverage. The few rocks and log stairs I noticed were easily avoided and probably taken care of by last night’s 10 inches of heavy snow. It was a glorious day. Although I’ve skied this 10-mile round-trip route countless times before, it never gets old. The stunning scenery and effects of nature on the soul are always good and always different. The snow-frosted, caramel colored ice inspires confection comparison. Please enjoy the photographic Avalanche Lake trip report! 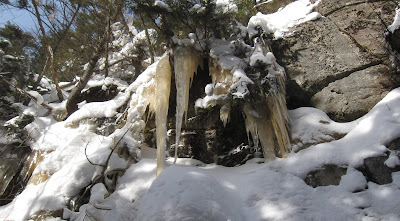 These icicles look more like a snotgurgle cave than a candy store. Destination Avalanche Lake was a great sunny spot for lunch and bundling up for the fun return downhill. Quote from the trail, “There is nothing else I’d rather be doing.” Agreed.